Spring has finally sprung, and the birds are chirping, bees are buzzing, and the air is warm and sweet. 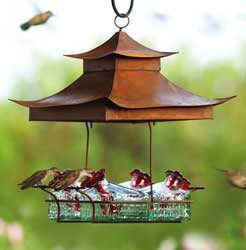 Hummingbird feeders make such a delightful and colorful addition to the beautiful weather. 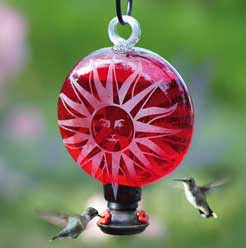 If you have never used a hummingbird feeder, consider adding one to your yard or deck this year. Hummingbird feeders require their share of maintenance, but once the hummingbirds begin to pay regular visits to the feeder, it is all worth it. To attract hummingbirds to your feeder, keep in mind that the feeder is filled with nectar for energy, not for food. Insects: If bees are an issue, you can set out another hummingbird feeder with a 1:5 sugar water solution to drive the bees to the sweeter feeder and away from the hummingbirds. Use ant moats to prevent ants from accessing the sugar water. Ant moats can be used above or below feeders. Environment: Hummingbirds are attracted to bright colors, so hummingbird feeders and flowers should all be vibrant in color for best results. Hummingbirds like open throated tubular pollinating flowers like fuchsia and sage, in colors of red, blue, orange, and yellow. Since hummingbirds are territorial, using more than one feeder, or feeders with multiple feeding ports, will attract many more hummingbirds. Hummingbirds like water to bathe and drink, so a bird bath is very inviting. Providing shade from sun and rain will also keep hummingbirds at your feeder longer, as well as help preserve the nectar in the summer. Relax outdoors and enjoy the entertainment of hummingbirds. One of the many benefits of providing an attractive environment for hummingbirds is the appeal such improvements make on your general landscape. The smells of the fresh flowers, the reflection of the sun off the decorative bird baths, and the bright colors decorative flair of the hummingbird feeders all provide beauty and outdoor appeal.